Take note that two bamboo inserts come with every one of our pocket and all-in-2 diapers and this should be sufficient for day use until potty training. Proper use of inserts can be the difference between a leaking diaper and a dry diaper. In the first months, using one insert may be sufficient, and then adding the second insert can avoid many leaks and frustrations as your baby grows. 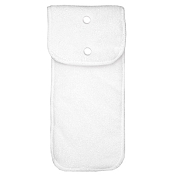 You may also fold one insert in half to increase absorbency in the front or back of the diaper depending on your baby's gender. Every baby is different and therefore properly adjusting the absorbancy to fit your baby's needs and cycles is key to succeeding in using cloth diapers...without frustrations.